A Discworld novel about Christmas. The Auditors hire a crazy Assassin Johnathan Teatime to kill Hogfather. Teatime gathers up a band robbers and happily does what he was hired to do. Every year at the end of the year, Hogfather gets into his sleigh, drawn by hogs, and flies around the world to give gifts to all nice children who have hung their stockings up. But rich kids get more and better gifts than poor kids, and kids get gifts that parents think are appropriate for them. This greatly puzzles the current Hogfather, Death. He and his trusty manservant Albert fly around Discworld in the Hogfather’s sleigh. Meanwhile, Death’s granddaughter Susan is trying to be an ordinary governess to a merchant’s kids (awkward when Susan is a duchess). When she finds out what Death is up to, she gets really angry and starts to investigate what’s happening. Meanwhile, something stranger than usual is happening in the Unseen University. This is a book about belief. Look, it’s great. Go and read it! A very entertaining Discworld book. A fantasy book about banking, the concept of money, and conmen. If you like other Discworld books you’ll most likely like this one, too. More specifically, if you’ve read Going Postal and liked it, you’ll like this one, too. Moist von Lipwig is a (former) conman and now a most respectable man, the Postmaster General of the Ankh-Morpork Post Office. However, the Post Office is now running smoothly and Moist is looking for other challenges, such as breaking into his own office in the middle of the night. Of course, he’s no longer a criminal and a conman so he can’t really want to return to his old life. He has just taken to carrying a set of lockpicks and rubber baton for his own protection. Right. So, when Patrician takes him to Royal Bank of Ankh-Morpork, which includes the Royal Mint, and wants him to take over, Moist refuses. However, he meets the current chair Topsy Lavish who is an old woman. She sees right through Moist and still likes him. Her little dog, Mr. Fusspot, likes Moist, too. When Topsy Lavish dies the next night, to his horror Moist finds out that she’s given him her dog – and the dog now owns 51% of the bank, making Moist the actual chairman. So, no matter if he wants it or not, Moist is now the chairman of the dysfunctional bank. The first thing he notices is that the bank doesn’t actually want many clients, just a few of the most wealthiest ones but definitely not any of the poor (just like some banks right here in Finland. Alas, they aren’t as much fun as Ankh-Morpork banks). Also, the smallest coins are made at a loss by extremely poor people and that people in general don’t trust banks. Additionally, people have started to use stamps as currency. The bank’s employees are a funny lot, chief among them Mr. Bent who never goes out during the daytime and trusts numbers but never people. The men who work in the Mint are a class in their own. The Lavish family wants Moist removed as soon as possible and the bank returned to its rightful owners: which ever one of them is still standing. Cosmo Lavish thinks that he’s the automatic leader of the family and is trying to become Havelock Vetinari – literally. A subplot involves Moist’s fiancee Adora Belle Dearheart. She runs the Golem Trust and is trying to dig out some of the very oldest golems from dwarven lands. Also, a greedy man from Moist’s past shows up. With really strange false teeth. The book’s philosophical ruminations are about money and banking: money, coins, gold don’t have any intricate value to humans, unlike, say air, water, and food, and so the whole money system is in fact imaginary and yet pretty much everyone is enslaved to it. Making Money is similar to Going Postal (Moist is forced to take over a place and make it better using his quick thinking and conman instincts. Of course, the bank isn’t nearly as run down as the post office was) but I don’t think it’s quite as good, or perhaps I just enjoyed Moist more the first time. Bent slapped him on the back. Hubert coughed. The sixth City Watch book. 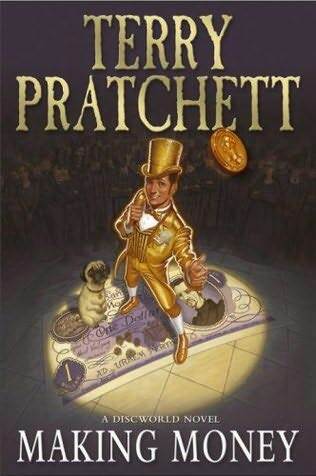 Pratchett is a fine form here and this is one of my favorite Discworld books. Commander Samuel Vimes is a bit scatterbrained because Sybil is giving birth. He’s also hot on the trail of a cold-blooded murderer Carcer. The criminal runs to the Unseen University and the police follows him. Unfortunately, both Vimes and Carcer are drawn into a magical storm and sent to the past. 30 years in the past into a darker Ankh-Morpok. Before Vimes can ask the wizards to help him, he’s arrested for breaking the curfew. He realizes that he can’t let Carcer to stay in the past and make a mess of it. He also hears that the man who should have been there, Sergeant John Keel, has been killed by Carcer. In Vimes’ past, Keel was attacked by local thugs but survived to become young Vimes’ mentor and idol. So, Vimes is in the strange position that he has to teach himself everything he’s ever known about being a copper… He also knows what happened during the Glorious Revolution of the Twenty-Fifth of May and even though he knows on an abstract level that he should let things happen as they did and just try to arrest Carcer, he just can’t let awful things happen. Especially to people he knows and works with. Or will know in the future. This is one of the darkest Discworld books I’ve read because Pratchett set the book in a city which is led by the insane paranoid lord Winder whose secret police, the Unmentionables, run the city with terror and torture. Pratchett also includes lots of dark themes such as revolutions, rebellion, competence (or lack thereof) of military officers, and morality of people in generals and cops in particular. And phrenology. There are humor and funny lines sprinkled here and there but not as much as in some of his books. The Night Watch is in terrible form. Taking bribes is business as usual and the Watch men also deliver prisoners to the Unmentionables, without ever having to confront the fact that they are bringing helpless people to torturers. Of course, Vimes has to take over and teach them to be real cops. Most of the cast is new and those few which are familiar are, in fact, younger versions of themselves: Fred Colon as a young constable, Reg Shoe (before he became a zombie he was an avid revolutionist), Nobby Nobbs (a street urchin), Dibbler just starting out on his vendor career, and Vetinari who is an apprentice assassin. I found this refreshing. The Agony Aunts were especially interesting new characters (or at least new to me). Especially interesting book for Vimes fans. “No! Please! I’ll tell you whatever you want to know!” the man yelled. ”People on the side of The People always ended up dissapointed, in any case. They found that The People tended not to be grateful or appreciative or forward-thinking or obedient. The People tended to be small-minded and conservative and not very clever and were even distrustful of cleverness. And so the children of the revolution were faced with the age-old problem: it wasn’t that you had the wrong kind of government, which was obvious, but that you had the wrong kind of people. Lord Vetinari needs a diplomat whom he can send to Überwald and he chooses Sir Samuel Vimes, the commander of Ankh-Morphok’s City Watch. Vimes is at first horrified but in the end he has no choice but to agree. Überwald is a huge country and is perhaps most famous for having a lot of dwarfs who don’t like them modern things, such as Ankh-Morphok. The dwarfs are about to enthrone a new Low King and Vimes has to negotiate a new trade deal with him. He takes with him Cheery Littlebottom (a dwarf who has admitted that she’s a woman and dresses accordingly, shocking other dwarfs) and Detrius (a troll). Meanwhile, strange things are happening in the city (as usual). Apparently someone has stolen the replica of the Scone of Stone from the Dwarf Bread Museum . Also, a man who makes valuable rubber item has been killed. Because Vimes leaves, Captain Carrot is left in charge. However, soon Carrot receives word that Angua has taken a leave of absence. Carrot suspects that he knows where Angua is going so and wants to follow her. So, he tries to quite the Watch but Vetinari changes it to a vacation. Carrot recruits Gaspode, that talking dog, and the due trails Angua to Überwald. Because Carrot leaves, the Watch now need a new commander. This role falls to Sargent Fred Colon as the senior officer. Unfortunately, Colon isn’t really suited to the task. Hilarity ensues! This book shows dwarfs’ culture a lot more. They become more three dimensional than just the stereotypes we’ve seen before. Previously, many of the dwarf characters have been just easily the gruff axe wielding, heavily drinking people. Here they even have a religion! It just doesn’t revolve around deities. To me, this book was divided into two: Vimes’ tale in Überwald isn’t laugh out loud funny but the Ankh-Morpokh tale is. Vimes’ story has a serious story line and ironic characters. I really enjoyed the Igors who are all called Igor and are made up of parts of other people. On the other hand, the werewolves and especially their leader were very serious people. Angua’s and Carrot’s relationship is also at a serious point. But meanwhile back in the city, the acting captain Colon is way out of his depth. Unfortunately (for him and the rest of the Watch, fortunately for us readers) he’s also out of control: he’s paranoid and micromanages everything, a real tyrant. I really enjoyed this one. Vimes has grown a lot since his first appearance. The Igors were fascinating and one of them has apparently joined the Watch. Cheery is now so comfortable with her femaleness that she goes out in a skirt. Pretty much that only thing I didn’t care for was the tension between Angua and Carrot. The sunken city of Leshp rises from the bottom of the sea and it’s exactly halfway between the territories of Ankh-Morpok and Klatch. Of course this leads to conflict between the two nations and in Ankh-Morpok the citizens start to harass Klatchians. Well, more than usually. In an effort to calm things down, the Klatchian ambassador, Prince Khufura, is taking part in a parade through the streets of Ankh-Morpok. Vimes and Vetinari are afraid that someone will try to assassinate the prince and the city guard tries to prevent this. However, Vimes is ordered to lead the parade, despite his strong objections. So, Vimes puts on his best clothes and starts the parade. Unfortunately, for everyone involved, he’s used to patrolling the city streets in a particular way. So, he slows down his pace and starts to twirl his stick while his mind works on problems and is trying to spot anything unusual. When he spots a suspected assassin, he starts to run – with the rest of the parade following. The assassin only wounds the prince and is found dead, supposedly fallen from a great height after the shot. Many people are quick to dismiss the assassin as a lone looney but Vimes isn’t convinced. He assigns Corporal Nobby and Sergeant Colon to investigate the supposed assassin, and assigns Carrot and Angua to investigate the assassination, secretly. Vimes also investigates it himself. He strongly suspects that a group of Ankh-Morpok’s nobility is involved but he can’t deny that there are shady characters among the Klatchians, too. Then, war is declared and Ankh-Morpok’s nobility welcome is enthusiastically and start to recruit. Jingo is another Discworld book with a strong theme of tolerance. People from both nations are shown to be quite similar in character despite the differences in clothes and foods. This is especially clear in the short snippets about two rival fishermen, Solid Jackson and Greasy Arif, who are trying to claim the new island for their own country, thoroughly embarrassing their sons in the process. The Ankh-Morpokian nobility is shown as idiots who have no idea how a war is really conducted but cling to out dated notions and romantic ideals read in books, and in the meantime costing real men their lives. Meanwhile, Klatchians have been waging war all the time and are better armed, too. There’s also a hilarious subplot where Nobby gets in touch with his inner, er, femininity. I think this book is more satire than jokes than the previous ones I’ve read from him. (Just an observation, not a complaint.) It ridicules just about every aspect of military conflict from the excuses to have a conflict to the butler who suddenly is a very competent soldier. However, I think the characters were more archetypal than usual. Lord Rust has especially lost any contact with the real world and sunken to new heights of stupidity. Then again, I really enjoyed Nobby’s and Colon’s attempt at undercover work and Carrot was hilarious as well. There really seems to be some sort of pacifying magic around Carrot. “Fortune favours the brave, sir,” said Carrot cheerfully. “According to General Tacticus, it’s because they favour themselves,” said Vimes. Lord Vetinari has been poisoned and it’s up to the City Watch to find out who did it. It looks like the Patrician might not make it and there is a cabal of “upstanding citizens” who want to resurrect the monarchy (again). Also, someone has murdered two old men who apparently lived humble lives and didn’t have any enemies and the Assassins’ Guild deny any involvement. One of the men was a curator in a museum devoted to dwarfish baking used in fights. Of course, Carrot knew him and was a regular visitor in the museum. The guard also gets a forensics expert, an alchemist whose job it is to experiment with all unknown substances found at crime scenes and find out what they are. The expert is a dwarf, Cheery Littlebottom, which is pretty unusual, but it turns out that the dwarf is a woman and she wants to do more feminine things than are allowed among dwarfs. This confuses Captain Carrot because in dwarfish culture, men and women dress the same and behave the same. However, Cheery strikes up a friendship with Angua without knowing that she’s a werewolf. When Cheery adds more feminine things to her outfit, we find out that a few of the other dwarven constables are also women, they just haven’t drawn any attention to it. Apparently, among dwarfs is indecent to show ankles. However, the more serious parts of the book concentrate on the golems. They aren’t considered to be alive so they are used as slave labor which can work all the time and don’t have to be paid. And yet, a lot of people think they are creepy and know that they are up to no good. Vimes also muses about people who obey the law and who don’t, and about rich and poor people. He’s trying to adjust to life as a rich man and being miserable. This is another enjoyable Discworld book. I particularly enjoyed the breads, cakes, and cupcakes used for fighting and the vampire who works in various normal, but hazardous to him, jobs. Oh, and poor Vimes is plagued by his new organizer. And of course everyone likes Carrot. “You are in favour of the common people?” said Dragon mildly.